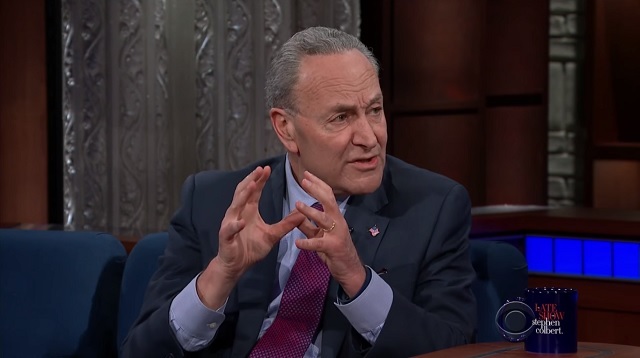 Senator Chuck Schumer issued a "challenge" for Donald Trump on Stephen Colbert's "Late Show" Monday night: prove you're not "racist" by supporting the leftist Graham-Durbin DACA amnesty bill. According to The Gateway Pundit, depending on which Spanish speaking country one is from, ¡Coño! can mean anything from "p-ssy," "c-nt," "damn" or "motherf--ker." "Do what we say or we will call you racist" is literally the only argument the left has had for at least three decades now. It's no longer working. As Scott Green noted Monday afternoon in The Daily Caller, The New York Times editorial board "officially designated Trump a racist" in an editorial on Friday but "nobody cared."